Nowadays, the word zero is one known to everyone and used frequently in different expressions. But things have not always been so. 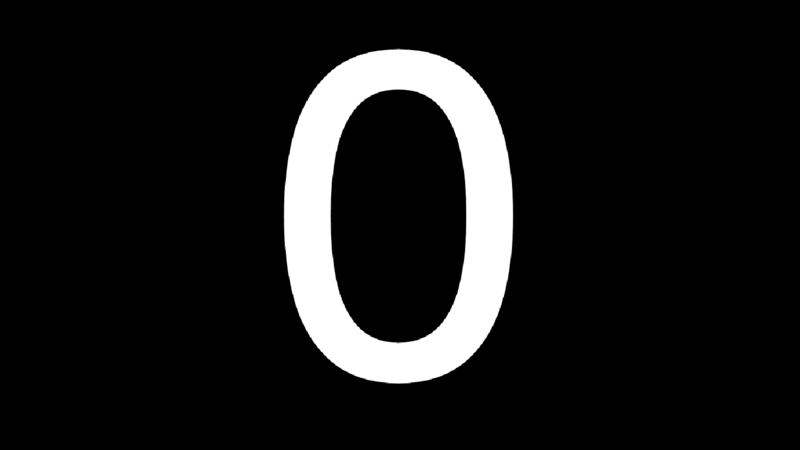 Zero is a very special number, different from the behavior of all other numbers, and its existence has given many headaches to mathematicians and philosophers. Originally, the numbers were invented for very practical reasons: the need to count the sheep, the measurement and delimitation of the land owned by someone, or the consideration of the passage of time. But for this it was not needed zero (no one wants to keep track of the zero and the one he has) and the people did well and without it. That until the need to write some bigger numbers came up. Then, about the year 300 BC, the Babylonians invented a symbol that meant an empty space on the abacus, thus introducing the use of classes and orders in counting. It does not matter that the Babylonians had a 60-count system, they used nails instead of numbers, and zero was represented by two oblique nails ... the beginning was done. The value of a number is given by the place it occupies in the string of natural numbers. But 0 originally had no place in this string because it was just a symbol that meant nothing. That is why the Greeks and Romans rejected it for philosophical reasons, because they could not conceive of the existence of nothingness. Even their calendars were missing year 0: 1 st century BC. was followed by the 1st century AD. The Mayans were the only ones who included the number 0 in their calendar, but unfortunately our current calendar is of Roman origin. This has led to a whole debate nowadays: what is the first year of the 21st, 2000 or 2001? Returning to the positioning of 0 in the series of natural numbers, it is enough to do a simple countdown from 1 to 1. From 3 we decrease 1 and we get to 2, 2 deduced 1 and we get 1, 1 deduction 1 and we get nothing, that is 0. So the natural order is 3, 2, 1, 0. Therefore, the digit 0 is the one that separates the positive and negative numbers. The fear of the ancient Greeks against 0 was grounded, as this number behaves like no other, defying the laws of mathematical operations. For example, if we add a number to itself, it changes (3 + 3 = 6). But zero plus zero gives zero. When multiplying and dividing, things are even worse. Multiplication means multiplication, so its result should be greater than or equal to multiplied numbers (2 × 4 = 8). But this does not happen when multiplying a number by 0, the result being 0. We have agreed that any number multiplied by 0 gives 0. So 2 × 0 = 0. Now if we divide equality by 0, we have to get (2 × 0): 0 = 0: 0. But how on the left I divided the result should be 2. So 2 = 0: 0. But if we repeat the procedure starting from 5 × 0 = 0, we get 5 = 0: 0. Vast, 2 = 5. .. which is obviously incorrect, even for a simple sheep count. Therefore, dividing to 0 does not make much sense ... to highlight this, some humorous mathematicians have started from the hypothesis that it nevertheless makes sense to divide to 0 and have reached absurd, but very funny conclusions, such as be: 1 + 1 = 42, J. Edgar Hoover was extraterrestrial or, worse, Winston Churchill was a carrot! No matter how fun these conclusions are, we must admit that dividing to 0 is not possible, giving him the proper respect for his unusual powers.